COTTONWOOD, ARIZONA, UNITED STATES, March 25, 2019 /EINPresswire.com/ — Good Omen Bottling, LLC® manufacturers of WILD TONIC® Jun Kombucha announces its partnership with Louis Glunz Beer, Inc. Together, these two industry leaders from vastly different ends of the spectrum, will bring Chicagoland the absolutely delicious, trendsetting Hard Jun that is taking the country by storm! 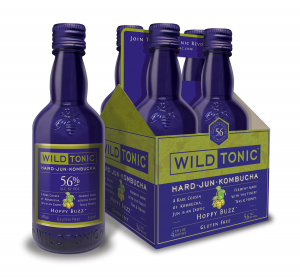 At WILD TONIC®, our passion is for pioneering cutting edge ferments in the world of Craft Brewing. Our leading award-winning Hard Jun Kombucha, along with our non-alcohol Jun, emanate mastery of the ancient art of fermentation with the unique use of sustainably sourced honey for an unparalleled signature smooth taste. We infuse exotic varietals of teas with organic fruits and botanicals to create light yet flavorful elixirs that promote an overall sense of wellbeing and elevated drinking experience. The effervescent nectar inside of each cobalt blue bottle is a crafted expression of our commitment to uncompromising quality, exceptional taste and conservation of the bee population for future generations. At WILD TONIC®, we want you to feel good about what’s inside. About Louis Glunz Beer, Inc. Through the efficient utilization of our highly motivated and trained employees, Louis Glunz Beer, Inc., a professional beverage distributor, will strive to provide exceptional representation of all of our suppliers, while providing our customers unsurpassed customer service, for every sale on every call. To learn more about the WILD TONIC® brand, visit http://www.wildtonic.com/. For a complete press listing, please visit: https://www.wildtonic.com/the-buzz/media/. To learn more about Louis Glunz Beer, Inc., visit: https://www.glunzbeers.com/.